help, as he was hurt. But pain can do funny things to a guy, and finally he said "step back" and he lifted the bike off of himself and stood up. Needless to say he didn't ride it further. The front end was shot and he had broken ribs. We had to re-think and re-route everything, and several days later when we finally returned for his damaged bike, one of my thoughts was "how the heck are we going to get it in the trailer?" Well, thank the biker gods for the arched ramp. Having a ramp to begin with makes every bit of difference. Besides, it is much easier to push a heavy bike up an arched ramp than a straight one, or even worse, one with a bow in it. 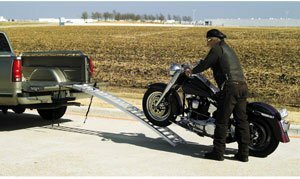 Whether you are transporting your bike to the shop for repair, or whether you are calling your buddy to come get you in the event of a breakdown, a motorcycle ramp will save you time and chiropractor's bills. The Biker's Choice Arched Ramp runs around $130 and is worth every last penny. Here's a wider ramp, sans arch but with a massive loading capacity.